Romulan is named for the Star Trek race of anthropoid aliens who are strict, militaristic, and serious. Romulan is a 100% Indica with as much as 20% THC. It is as serious as its namesake. It gets its potent sedative properties from White Rhino, named for the thick coat of white THC filled trichomes covering the plant. 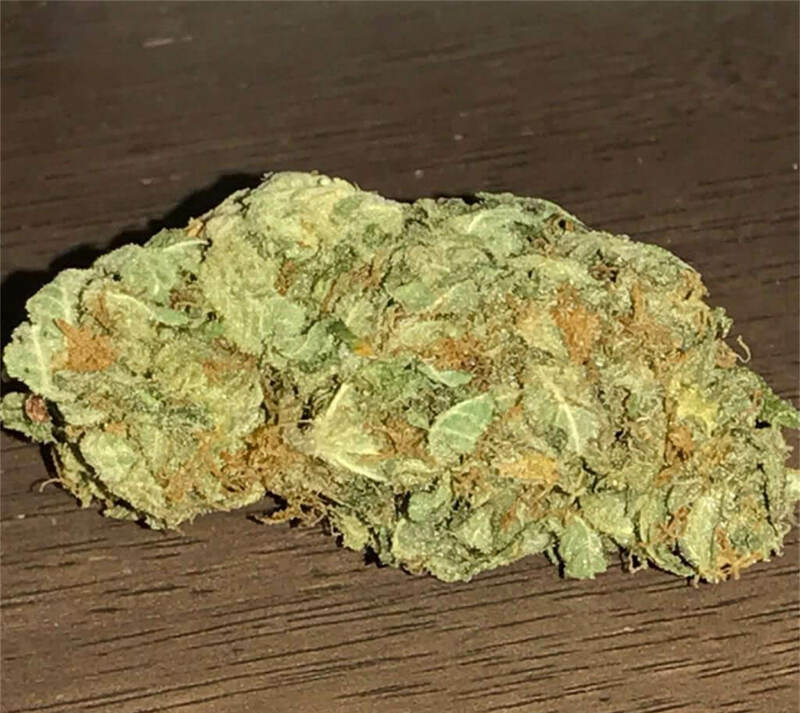 It is then mixed with a North American Indica which is not well characterized, but the result is a pure Indica, greatly appreciated by seekers of unique marijuana varieties and medical users alike. May Relieve Romulan buds are a revered medicinal strain. It can relieve musculoskeletal pain such as back aches and muscle stiffness from repetitive work activities and chronic stress. During sedentary work, individuals often sit in positions without much movement for extended periods. Over months and years, this leads to constant back problems and muscle pain. 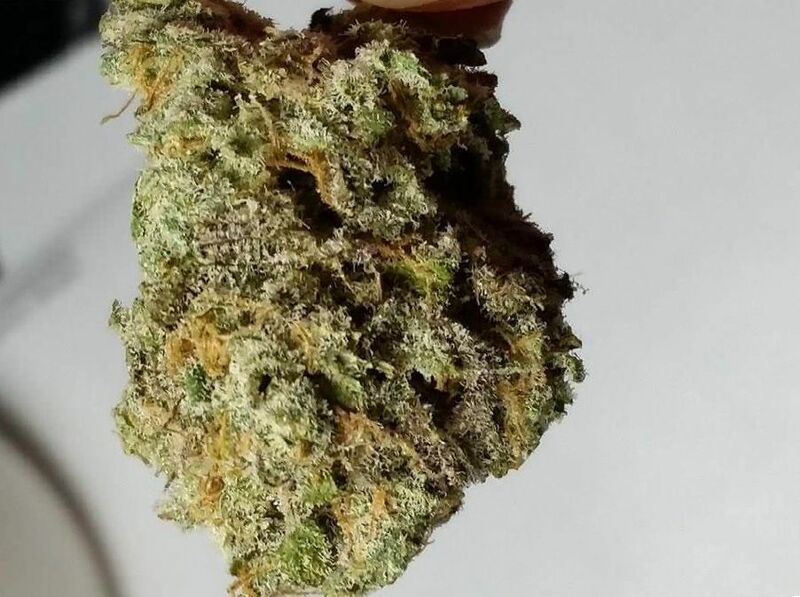 Romulan strain bud can relieve the muscle pain and stiffness. It can relieve back and shoulder pain. 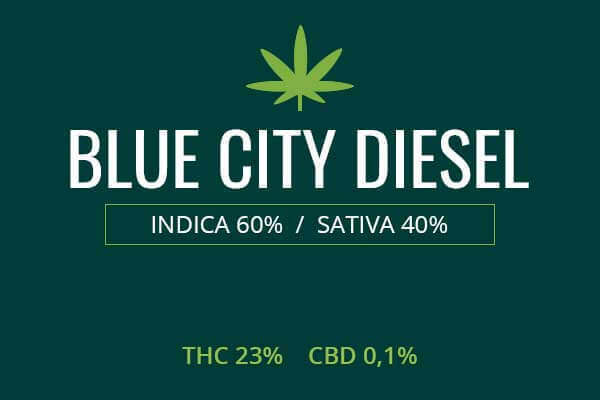 This bud can also help with migraines, neuropathic pain, shingles pain, fibromyalgia, peripheral neuropathy, and pain associated with arthritis and other inflammatory conditions. Indoor/Outdoor Yield Indoors, a yield of 9 ounces per meter squared of potent medicinal Indica can be expected. Grown outdoors, cultivators can gain 9 ounces per plant of powerful cannabis around the middle of the month of October. Flowering time Romulan plants will flower in eight to nine weeks and be ready to yield its bounty of THC, CBD, and other cannabinoids and terpenes for the medical and recreational user alike. Harvest Romulan will flower and be ready for harvesting and drying in the middle of the month of October. Plant Height Romulan marijuana plants grow to a medium height, between 32 and 80 inches tall. Adverse effects Romulan marijuana has little potential for side effects at doctor recommended doses. 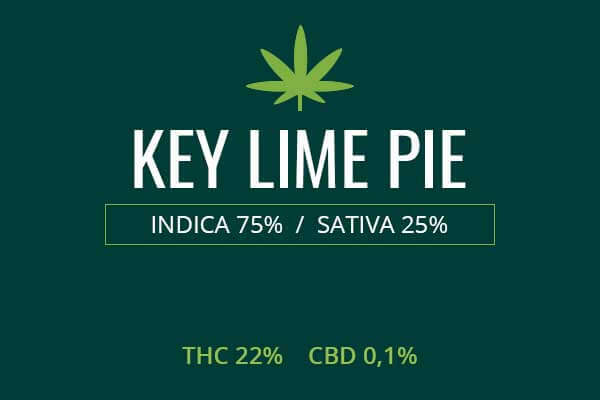 Its strong Indica properties may come along with a slight potential for causing cotton mouth, dry eyes, and rarely, anxiety and paranoia. Romulan is named for the powerful alien race of anthropomorphic beings from the Star Trek franchise, known for their power and serious countenance. This strain is also powerful, but unlike its uptight Romulan namesake, is sweet and relaxing. 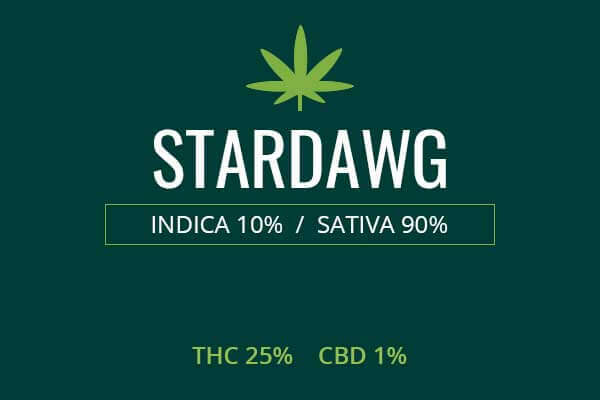 It is a 100 percent pure Indica, descended from the trichome-rich White Rhino, and a North American Indica of unknown origin, but able to bequeath its pure genetics to its Romulan offspring. It gives a space odyssey-like high, putting the mind into a new and unique perspective. The Romulan plants are of a medium height, from 30 to 80 inches. Like White Rhino, named for its white sheet of trichomes, Romulan cannabis is covered in a heavy layer of frosty icing resins. The Romulan strain marijuana has fragrances and tastes which are indicative of natural origins and purity, spice, earthiness, pine, and citrus. 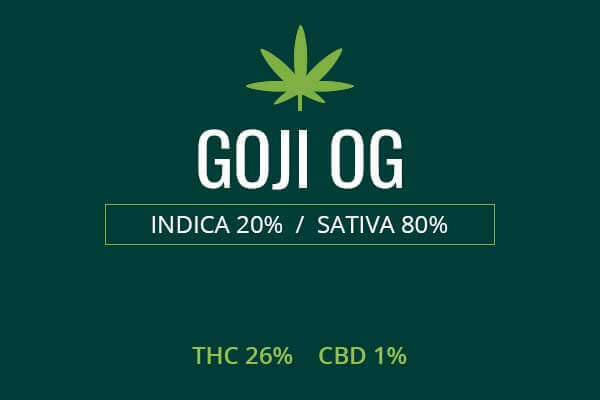 Its pure genetics make it a smooth but strong smoke, possessing in bounty the resins the plants use in a natural environment to ward off predators and attract humans to its therapeutic potential. Growing weed from Romulan cannabis seeds and cuttings is rated as comparatively easy to moderate. A sunny, dry, Mediterranean climate will be needed to get these plants to grow. This can be simulated indoors or grown outdoors. Seeds or cuttings must be obtained by a seller according to your local laws, and where legal, may be ordered by mail from seed sellers. 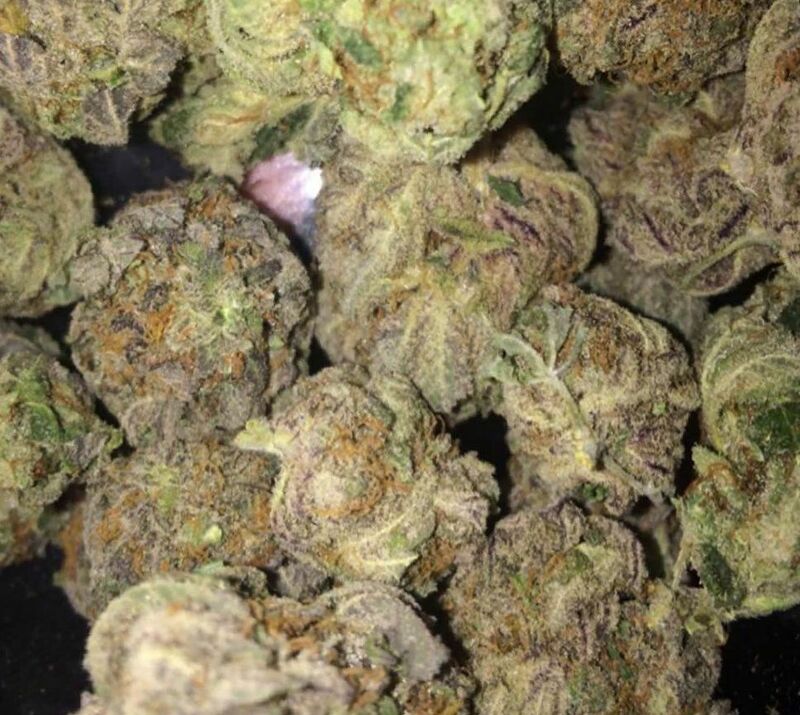 Indoors, this strain can be grown using High Density Discharge Lighting and a tent with reflective lining. Five-gallon buckets with overflow holes in the bottom can be used to fill with soil and a fertilizer such as Flower Power. Airflow should be maintained with a fan and exhaust system. The soil should be kept moist and the air dry. A watering scheme should be implemented and monitored. 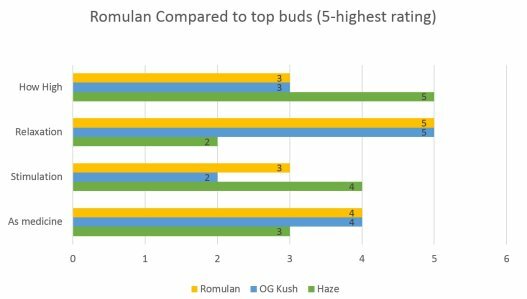 After eight or nine weeks, Romulan strain plants can be induced to flower with a light/dark schedule recommended by your seed vendor. Indoors, Romulan strain will yield about nine ounces per meter squared of pure relaxing Indica marijuana. Romulan strain plants will grow much easier outdoors in a sunny, warm, and dry environment with rich soil and added plant nutrients. You can expect nine ounces per plant of Romulan weed from your outdoor harvest. 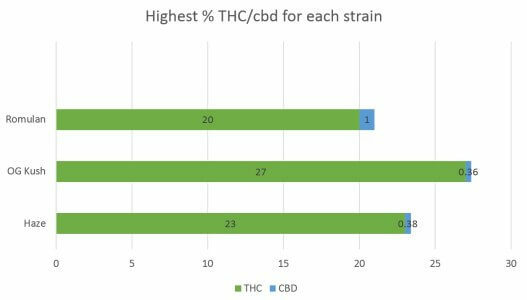 Romulan medical cannabis has THC levels as high as 20 percent. This gives it the power to relieve musculoskeletal pain. This includes back pain, sciatica, muscle cramps, and neck and shoulder pain which may result from sedentary lifestyle or repetitive movements during work activities. Romulan cannabis can help those suffering from forms of neuropathic pain as well. This includes conditions like diabetic neuropathy, fibromyalgia, and shingles. This type of pain is caused by damage to the nerves by underlying conditions. Romulan medical marijuana can also treat pain caused by inflammatory conditions like arthritis and lupus. Romulan medical cannabis is especially valued for its ability to induce relaxation and treat conditions of nervous excitation and mood disturbance. This can make it a great choice for treating depression, anxiety, and chronic stress that result from everyday stress and friction. Its pure Indica genetics can allow the mind to come to a place of peace from which it can see more clearly how to proceed. It can also treat the psychomotor agitation and hyperactivity which is the defining characteristic of ADD and ADHD. Romulan weed can treat nausea that can result from cancer treatment and conditions like dysautonomia. This can be a great boon to those who are unable to keep down anti-nausea medications, as it can be smoked or vaped. Romulan medicinal marijuana can improve appetite. This can be useful to those suffering from conditions which make it difficult to eat and therefore suffer wasting of fat and muscle tissue. Cancer and HIV are examples of conditions which can be improved when patients use medicinal Romulan cannabis to improve appetite and gain weight. Romulan medical marijuana can also help relax the minds of those with insomnia and allow them to drift off into a peaceful slumber. Romulan weed is the perfect strain for relaxing after a hard day of work. You will notice all the pain and muscle strain that you have accumulated throughout the day melt away instantly. You will be encompassed in a blanket of warmth and relaxation. This will make it possible to better relate to loved ones, friends, and family. An improved appetite will make you better able to appreciate your meals. Finally, be ready to drift off into a relaxing, cerebral, mind-altering high which is like a journey through outer-space on the Romulan fleet. You will find yourself drifting off into fantastic dreams and refreshing sleep.